This is from Janet at Lanetz Living, who has TWO copies of this in stock (as I write this) in B35 and B37. I *almost* made one of them mine, but I'm trying to hold fast to my resolve not to buy any more patterns until 2010. If you are not laboring under a similar resolution you might want to know that Janet is having a sale: 25% off your entire order (one time only); it ends 12/31. Nice accessories! This IS elegant, but could also go Pilgrim for Thanksgiving theme parties if it were all brown, and just the center piece white, front and back. I am beginning to think no hostess wardrobe is complete without a jaunty yet subtle Pilgrim dress for the holidays. Think of the memories youd be creating! And it could be passed down through the generations, like a Santa suit. Whats wrong with their necks? Do they have some sort of curvature of the spine? i too like the sleeved version. Thats the famous swan neck of myth and legend and pattern envelope. Me, I dont find the no shoulders look to be attractive. Lacking a diminutive and modest spirit, I actually have shoulders and prefer something with a set in sleeve. Simple but elegant. One could do a lot of embellishments on this pattern. Cute. Ive noticed the slenderette label before, too. 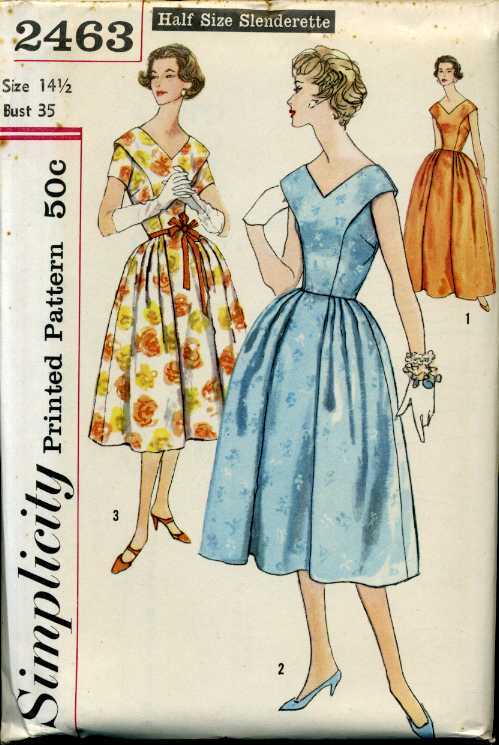 It sounds like an artificial sweetener.Theres a sad line of patterns from the 1950s and 60s called CHUB-DEB. I dont know if Deb is supposedly a person, or a debutante. But the girls on the patterns always look perfectly fine. Half size slenderette fit me better because they are for full figured short ladies. I wish they still made them. So Slenderettes are more about height? Theyre Petitettes? Cookie – well short women anyway. Im 52 but broad shouldered and large bossomed. I guess you could say its a height and weight thing. I know its the holidays but I am strting to get worried about Erin. I fear she may be trapped under a giant fruitcake. Half sizes are designed to fit 53 and shorter. Slenderettes were designed to fit fuller figured women. Slenderettes were designed to fit fuller figured women. So, Im missing where the slender part comes in? The slender, cookie, comes from the style of the pattern — its supposed to make you look pounds slimmer.